Coryell, 48, had a 104-19-2 record in 12 years at San Diego State. He had developed future NFL players such as quarterbacks Dennis Shaw of the Bills, Don Horn of the Broncos and Brian Sipe of the Browns, and receivers Isaac Curtis of the Bengals and Gary Garrison of the Chargers. Outside of the San Diego area, Coryell was “an unfamiliar name to most,” according to The Sporting News. Seeking a challenge at a higher level, Coryell had written a letter to Cardinals owner Bill Bidwill, inquiring about the job after Hollway was fired. “People told me that, if I wanted a college coach, there was this guy at San Diego State,” Bidwill said. Coryell received a three-year contract from the Cardinals. The only other candidate considered for the position was former Packers quarterback Bart Starr, United Press International reported. One reason Coryell was confident he could succeed was the presence of quarterback Jim Hart on the Cardinals’ roster. Hollway had soured on Hart and had tried Gary Cuozzo and Tim Van Galder at quarterback in 1972. After a 4-9-1 record in 1973, St. Louis was 10-4 and won a division championship in Coryell’s second season, 1974. Hart thrived in an offense with running backs Jim Otis and Terry Metcalf; receivers Mel Gray, Earl Thomas, Jackie Smith and J.V. Cain (Ike Harris and Pat Tilley later contributed significantly); and linemen Dan Dierdorf, Conrad Dobler and Tom Banks. Winning championships with flair, the football Cardinals began to rank in popularity with the baseball Cardinals, who went without a championship in the 1970s, and Coryell began to emerge as one of the iconic coaches in St. Louis sports. A 10-4 finish in 1976 was followed by a 7-7 record in 1977. Coryell and Bidwill feuded over control of the draft and personnel decisions. 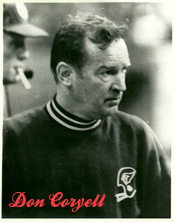 Disenchanted, Coryell went back to San Diego to coach the Chargers and led them to the NFL playoffs in four consecutive seasons. Stands out (with Ariens) among a cast of mediocre and dreadful HC’s in Cards history. Leave it to W Bidwill to blow it. Yes, it’s a shame his run with the Cardinals was just 5 years. Reblogged this on THE BIG RED ZONE.